That’s Keith Bramma’s age. Me. Born in 1961. The year Jacques Anquetil won the Tour de France. A whole 20 years before Specialized introduced the Stumpjumper, the world’s first major production mountain bike. The first bike I rode was a single speed 26” Malvern Star. Heavy as lead. I was aged seven. And I was lucky because I lived on the Moree Plains! The five oh party. Venue booked. Sport was still a focus. Barefoot bowls for Bramma’s birthday bash at the Manly Bowling Club followed by bountiful beverages, complete with Best and Fairest Awards and a specially made birthday cake. But the date was March 26! El Pres, Fearless Mountain Devils Leader rolled out an email on a dark scary tenth day of December 2010. Storm clouds had been brewing. Maybe there was an eclipse behind the cloud because it was dark and very ominous. Devastating news unfolded as I opened El Pres’ email “NSW MTBO events in 2011” at 4.06PM that day. Six lines in and the news hit me like a steel crankset whacked between the legs, just on the bottom of the torso. “26/27 March Wingello State Forest“ in all of its bolded 13.5 points font size. Slippy, my loving Salsa Dos 29er MTB Orienteering Bike, somehow felt the energy 10 km away. She wailed! Her rider, now nearly 50 years old, was experiencing tumultuous torture, and she wasn’t sure why. Her almost 50yo rider was wheeling in frenzy with mixed emotions as he worked out that he was going have to miss his 50th party to compete in the Wingello South SS1. What will the party participants think of that? No birthday boy! Who is the course setter I wonder? Hah! Marcel Van Schie, Esteemed MTBO Course Torturer Extraordinaire! Heh, heh, now I really can upset him. He will have to set the SS1 course event but he won’t be able to go to the event. After recently being my best man at my wonderful wedding, how could he not come to the party if I ask him. Priceless! A friendship totally based on how much you can really pi** your mate off! True aussie mateship. Perfect. With warp speed, I told Marcel about the five oh party being on March 26th with much happy enthusiasm. Whoa, not happy Jan!. Mate, can’t you reschedule the party. No, why?! Heh, heh. We are even better mates now. Aussie mateship can be strange at times. Kate and the birthday cake maker had found a true theme. The sport of MTB orienteering would be portrayed. Controls would be included. Notice the Salsa ensign on the bike. 29 inch wheels too. Cool huh. Why is Keith, who is now 50 years old, not on his bike, sitting down peacefully with a wry and satisfied smile. 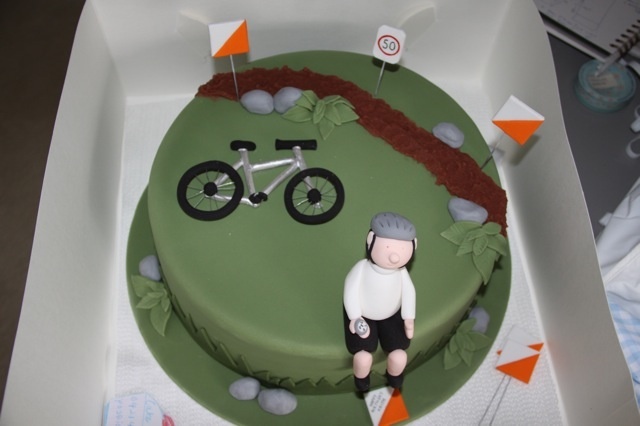 I somehow think the cake maker has Keith celebrating a Super Series win, reflecting on his perfect navigation through totally tortuous terrain. All on Slippy, his Salsa Dos 29er! The first Super Series weekend of the year saw more than 80 riders enjoying the trails of Wingello in surprisingly dry and good conditions after an ominously wet week in Sydney. On Saturday, Marcel van Schie set some fantastic, truly middle distance, courses on Wingello South, with an innovative use of “rides” through the forest. Some were certainly more rideable than others! They were almost certainly the best route choice on the short, zig zag legs, but it took a bit of brain rewiring to shove the bike through the thick grass on the edge of the track and commit to a rough ride or push through the gap in the forest. And just when you thought it was all done, the last control required some more thinking and finding, and caught more than a few people out. Standing around the download were lots of happy faces, not too many muddy bikes and some brand new converts to MTBO. Unfortunately, the organiser (not Marcel or I) forgot to ensure that the key MTBO rules were on display at registration … and so a number of riders were observed to have either taken their bikes off the mapped tracks (or “rides”), or left their bikes to run down to that trickily placed last control. MTBO Rule reminder #1: riding through forest (marked green or white) is forbidden, and can lead to us losing access to areas. If it’s not marked as a track or yellow on the map, just don’t go there. The Forest Camp provided a great base for those camping Saturday night, as well as the Mountain Devils AGM, a quiet drink and plenty of vigorous post mortem discussions. The social scene at the Camp added immensely to the event atmosphere. The long distance course on Sunday started with a “scatter” (free order), and the range of choices of controls visited made the course setter very happy. Just before the start, some new MTBOers were treated to a special briefing from a Past President, breezing in unexpectedly in a very shiny ute – thanks very much to Geoff Charnock for providing this unexpected service. The first riders to quickly gather the requisite punches were some Course 5 youngsters, followed by a flying Rob Prentice, who took about 12 minutes to visit 5 controls... A few riders came through the map change proudly announcing that they’d managed to ride every bit of single track. Not the fastest approach, but they certainly had the biggest grins. A couple of riders came in from the “other” direction, having found the fastest route choice home from no. 8. The line course section also provided some fun single track options, and some a little more adventurous... Sadly, Course 1 had a late control change that meant Dave Simpfendorfer’s winning time of 95 minutes was a bit under the odds. Simon Nott and Rob Prentice also made Course 3 look a bit underdone … or maybe they should be riding Course 2! On the whole, there seemed to be lots of very satisfied riders rolling into Forest Camp, including some with skin off, Hilary Dyer making it all the way around Course 1 despite a heavy dose of ‘flu, plus the 2 girls arriving right on course closure time and still smiling after 3.5 hours of “don’t even ask” navigational adventures. On a more serious side, there were a couple of comments about “aggro” at controls in the first ‘scatter’ section. It’s pretty unusual to have to wait at an MTBO control, so if it happens to you, please be patient and pleasant (as most people were) – remember, there’s no big prizes on the line here! Thank you very much to David West for an incredible amount of work, field checking, editing maps, checking maps, getting maps printed, processing entries, troubleshooting SI, putting out controls, setting up and removing start/finishes, dealing with unhappy neighbours, running the AGM, keeping proceedings from running dry and displaying the kilt. Thank you also to Michael Roylance for SI programming, as well as Rowan Bouttell and Nick Dellagiacoma for running SI at the events, as well as the many people who helped with control collection after each event, those who helped run registration, and those who helped pack up and transport the equipment. Having such a small location to set within presented its own challenges and while I did not think I would be able to slow the fast riders down I tried to set a course in which I had hoped to limit the number of bonus points available to less than 15, which I managed, though by only 1 point. Congratulations to Matt Bacon top scoring with a total of 78 (64 possible and 14 bonus points) and many thanks to those who gave me positive feedback, my cryptic course notes aside. Finally thanks to the 53 riders who participated in the event, which at one point was looking like not actually happening. BOSS 6, the final event of the Mountain Bike Orienteering Summer series, could not have produced a closer finish. Steve Todkill was leading after 5 events by the narrowest of margins. Any of the top three male competitors had a chance of taking out the series. Damian was first home with an impressive course clearance with time to spare, Steve would have to be at least a minute faster to stay ahead. Next home was Malcolm 4 minutes quicker than Damian, could Malcolm pull off the double after sneaking home to win BOSS 1 last year. Matt Bacon was next back, his stunning time of 60:41 earned him 14 bonus points and had me back on the calculator to recompute the top three. Finally a sorrowful figure came into sight, it was Steve Todkill pushing his bike home, his pockets bulging with the remains of his drivetrain. After rechecking the numbers Steve had hung on to top spot by the narrowest of margins, Malcolm was second and Damian third, only a single point separated all three. The womens competition was also decided at the last event, again any of three could win. Last year's winner, Mary Fien, did not compete so it was left to Newcastle locals Nicole and Carolyn to battle it out. Carolyn needed to win by 1 or 2 points, but returned 4 minutes early and a point behind Nicole. The result was that Nicole won the series by 5 points over Carolyn, with third place going to Alison Curtin. Overall participation in BOSS 2 was slightly higher than the amazingly popular BOSS 1 last year, with a record 88 at Killingworth. Thanks to all who made it possible, especially the course setters, all of whom who had not set a BOSS event before, (In several cases it was their first experience of bush setting). And thanks to everybody who has commented on how much they have enjoyed the series. BOSS 3 is already in the planning stages, currently there will be six events plus a possible warm up event. Hopefully we will have some new maps to ride on. If anybody feels like drawing a map/helping to draw a map then please let me know. However last year 21 people attended every event, this year this number was down to only 15 of these there are 8 who have attended all 11 events. The 5th event in this MTBO series was contested last Sunday morning at Pelaw Main. Thanks to organiser/setter Greigor Scott for a great course. The weather also played its part with only one brief very light shower during the event. The damp morning didn’t seem to dampen the enthusiasm of the riders at Pelaw Main, but maybe it was the reason there were no trailbikes out and about. Because it is a fairly restricted area to ride in, and very flat, I had to try to slow the riders down somehow, and using some fairly indistinct tracks seemed to be a good strategy to make the navigation a bit more challenging while providing some new control locations. I did keep out of the maze of tracks near the start for the most part though. The strategy didn’t seem to work for Steven Todkill who cleared the course with 8 minutes to spare, and Andrew Haigh also managed to get them all- with 8 seconds to spare. Anyway most riders seemed to enjoy the ride. Denis Lyons for the map, the vetting, the starting, flag collection and other bits and pieces. Diana Scott for entries and scores, Nicole Haigh for the finish, Mick Kavur for setting up. Russel Wilcox and Steven Todkill for flag collection. All the others who helped in many ways to make the morning and packup easy for me.